Description: Many places claim to be the center of adventure, but Moab truly is surrounded by amazing things to see and do. The city is near two unique national parks, a state park, a major river, and a mountain range. The city's Main Street is a memorable destination itself. Historic buildings and tree lined streets make this town a charming oasis. Great restaurants and many hotels mean that you don't have to travel far for comfort. And chances are, you'll find a souvenir to take home in one of the many gift shops. Location: Moab is about 4 hours southeast of Salt Lake City, Utah. It is about 6 hours west of Denver, Colorado. Highway 191 runs through the town and is it's Main Street. Cost: Moab offers activities for every budget. Even just walking up and down Main Street and window shopping is enjoyable. Operating Seasons and Hours: Many of the stores and restaurants are open all year, but this place is definitely more lively during the spring, summer, and fall than the winter. This was the first stop on the sixth day of the Southern Utah Road Trip that my husband and I went on in May of 2010. We left Ron's Pack Creek Campground on the southern end of Moab and drove the three or so miles into town. We didn't plan to spend much time in the city. We were really just planning on filling up the Jeep's gas tank, and buying some fresh food at The City Market grocery store. We didn't realize what a tourist hot spot Moab was. I was expecting it to be just another sleepy Southern Utah town. Instead I was surprised that the town had a cool vibe to it - even at 10:00 am. A lot of places claim to be the center of adventure, but nothing compares to what the area around Moab has to offer. The entrance to Arches National Park is only a few miles north of the town. Dead Horse Point State Park and the Island in the Sky District of Canyonlands National Park are each 35 miles to the northeast. The Colorado river runs through the town. You can book a raft trip on the river or run the river with your own raft, canoe, or kayak. There are miles and miles of mountain bike and ATV trails. The La Sal Mountains also offer plenty of recreation opportunities. If you want to get really crazy you can even go skydiving over the area. Moab is the place to relax after your adventures are over, Some small towns that are near national parks can feel like tourist traps, but that is not the case with Moab. Moab has the feel of a resort town. 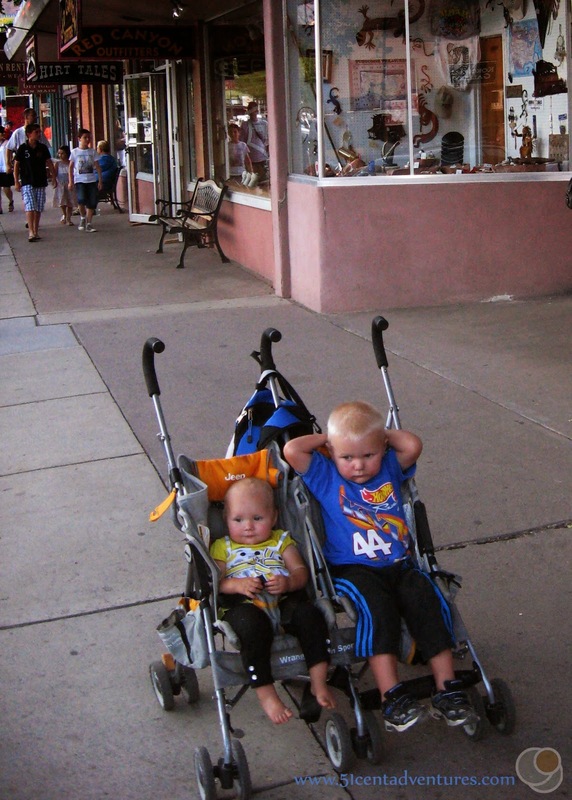 The down town area has tree lined streets which are always appreciated when you are travelling in Southern Utah. Main Street has many historic buildings that house local businesses. There are restaurants with delicious food. There are many hotels where you can stay if you don't want to spend the night camping. As we drove up Main Street I knew that we had to stop and experience the town. There were crowds of people walking on the sidewalk. Everyone seemed to be in happy moods and very relaxed. So we found a place to park, and went for a quick walk up and down the Main Street area. There were souvenir stores with thousands of trinkets, but the only money we spent was 51 cents - at a penny pressing machine. We had several places to visit that day so we couldn't stay long. That turned out to be okay because of two years later in June of 2012 we were able to make a return visit. Moab and Arches National Park are the only places from our 2010 Southern Utah Road Trip that we've been able to visit again. Moab is the only place we've visited more than two times. On our second visit we had a whole evening to experience the town. The company my husband worked for was participating in the Raft for the Cure river rafting event on the Colorado River. They paid for our raft tickets, our hotel, and gave us about $40 in spending money. By this time we had three kids (yes, you read that right, we had three babies in less than two years), and we weren't about to pass up a deal like that. My parents took care of our children and we were left to enjoy a weekend to ourselves. On the first evening we checked into our hotel, and then went to enjoy the town. 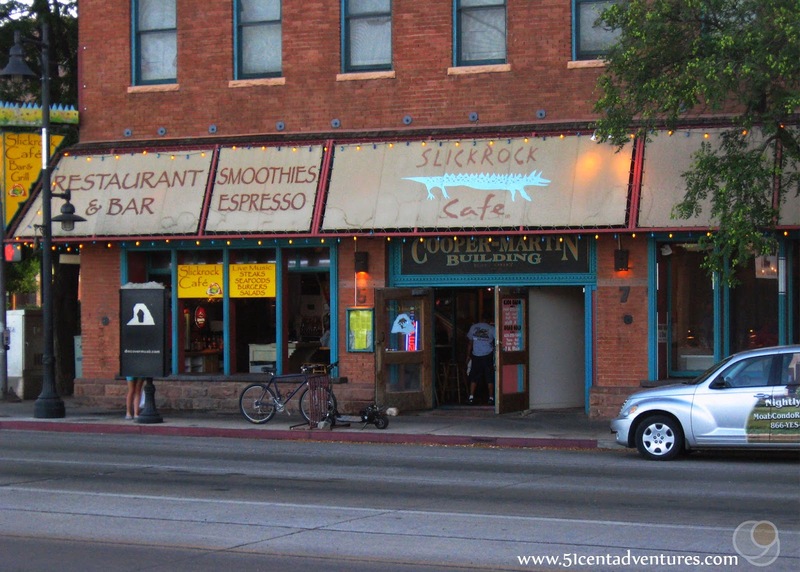 We had dinner at a place called the Slick Rock Cafe. That place served the best wraps. I still crave them every time I think about that trip to Moab. Unfortunately that restaurant has gone out of business so I can't satisfy that craving. Then we walked up and down Main Street. We had fun checking out all the little souvenir stores that line main street. Most of the stores carry the same type of souvenirs you can find anywhere. Even the Red Dirt Shirt T-shirts aren't as unique as they make you think. (We saw the same type of shirts for sale in Tombstone AZ a few years later.) We had lots of fun looking at everything without having to keep our kids from breaking anything. The weekend was a slice of paradise, and part of what made it so great was that Moab is a fun place to visit. We passed through Moab again when we moved to Texas in December of 2013, and again when we came back to Utah for a visit in December of 2014. Both times the town seemed to be hibernating for the winter. We didn't even bother to stop the car. It wasn't until my most recent trip through Moab in July of 2014 that I was able to get out of the car and experience Main Street again. My in-law were helping me travel to Utah with my kids while my husband was in Korea. We stopped for dinner at the McDonald's in Moab. Then we stretched our legs by walking up and down Main Street for a few blocks. My in-laws hadn't been to Moab in over 20 years. They kept commenting that the town had really grown since the last time they visited. There was no way I was taking my four children - who were all under the age of four - into the gift shops. So we just walked up and down the sidewalk. 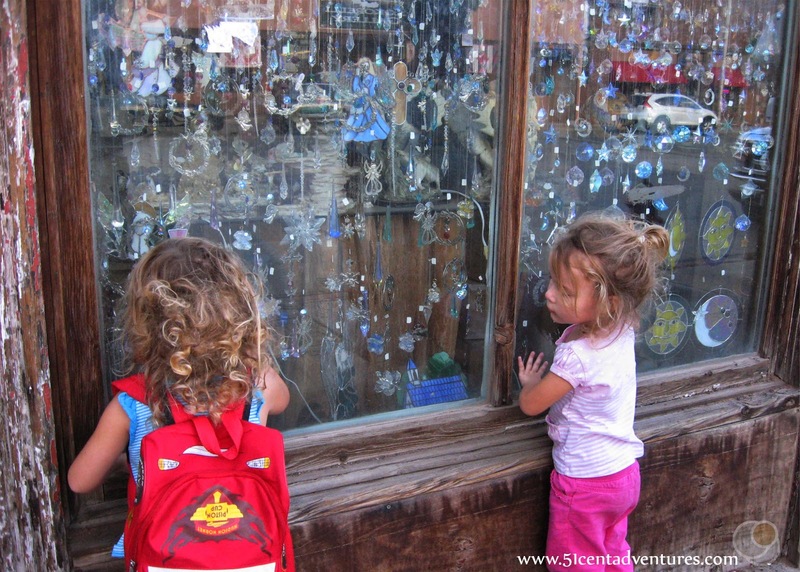 My three year old twins had fun looking at everything through the windows. My two year old son and 10 month old daughter were just happy to be out of the car. I'm looking forward to the day when my kids are old enough to enjoy all the adventures that are available around, and in, Moab, Utah. Recommendation: Moab is the the jumping off point for just about any adventure. No matter what brings you to the area you should definitely plan some time to take in the Main Street. Directions: Moab is about 4 hours southeast of Salt Lake City, Utah. It is about 6 hours west of Denver, Colorado. If you are travelling on I-70 you will take Exit 182 and then travel south on Highway 191 for about 30 miles. 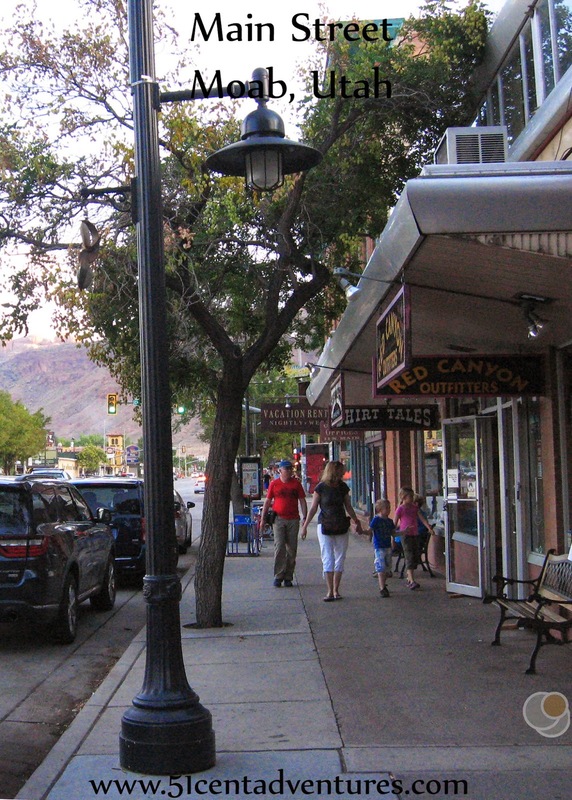 Highway 191 becomes Main Street in Moab. 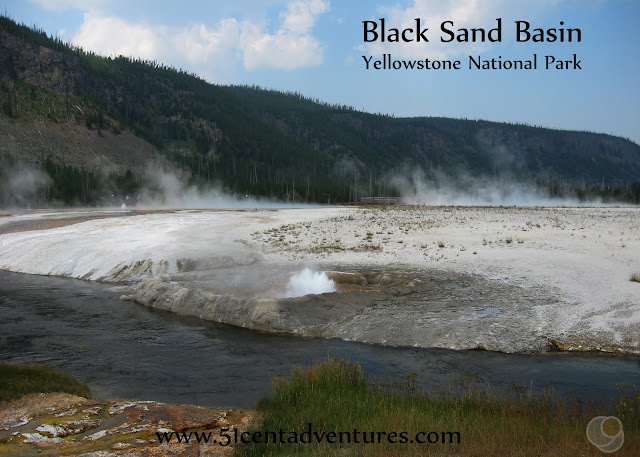 Black Sand Basin - Yellowstone National Park.